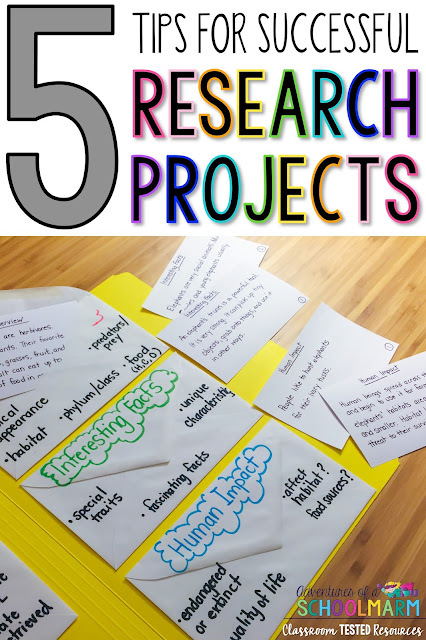 Are you overwhelmed by the thought of doing a research project with your elementary students? I understand. 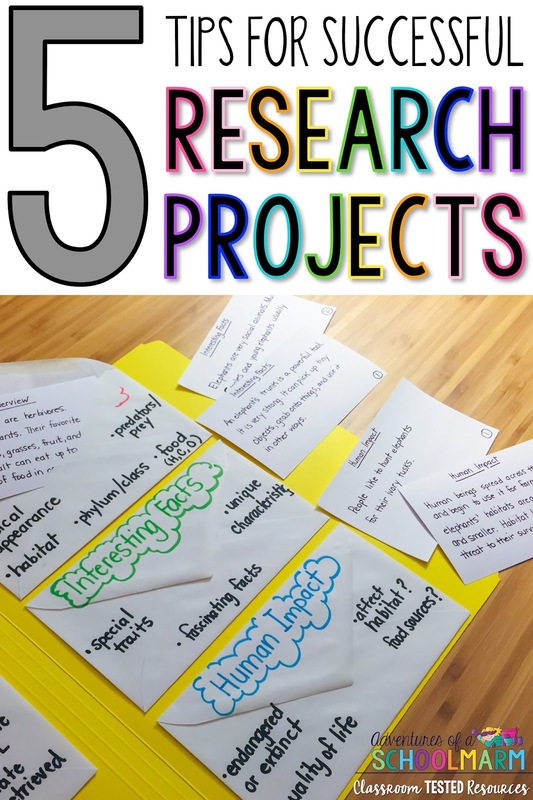 Research projects cover a large variety of standards, can be difficult to keep organized, and can be even more difficult to find resources for that all students can read. I have found some tricks to make research projects much easier. These tips will help streamline the process so that ALL of your students will be successful, including students that struggle to write complete sentences. 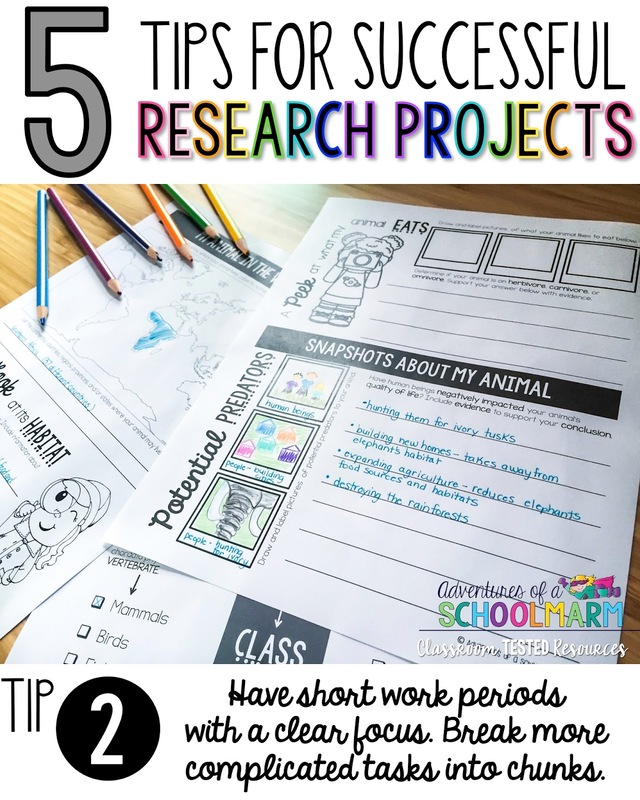 Use these tips to make your elementary research projects engaging, motivating, and enjoyable again! 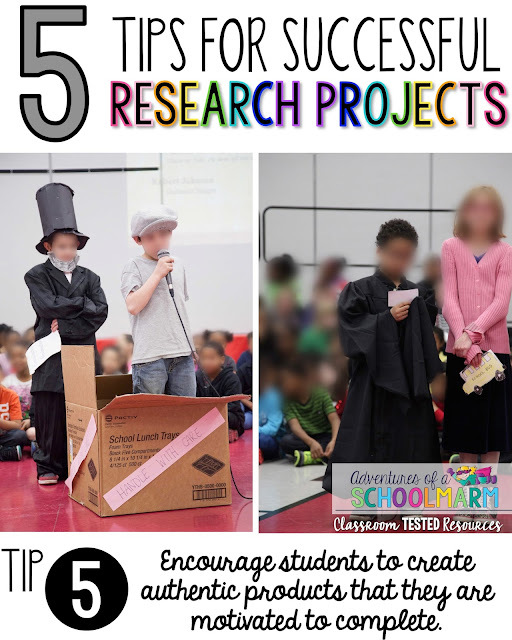 Elementary Research Project Tip #1: Have very clear expectations. Successful elementary research projects require a lot of upfront planning. It's important that you know exactly what you expect from students ahead of time. Otherwise, both you and your students will be frustrated. Kids thrive on knowing what to expect, so taking the time up front to figure this out will definitely pay off! I like to provide students with RUBRICS for their writing that are clearly aligned to the standards. I also MODEL every step of the process with them before expecting them to do it on their own. 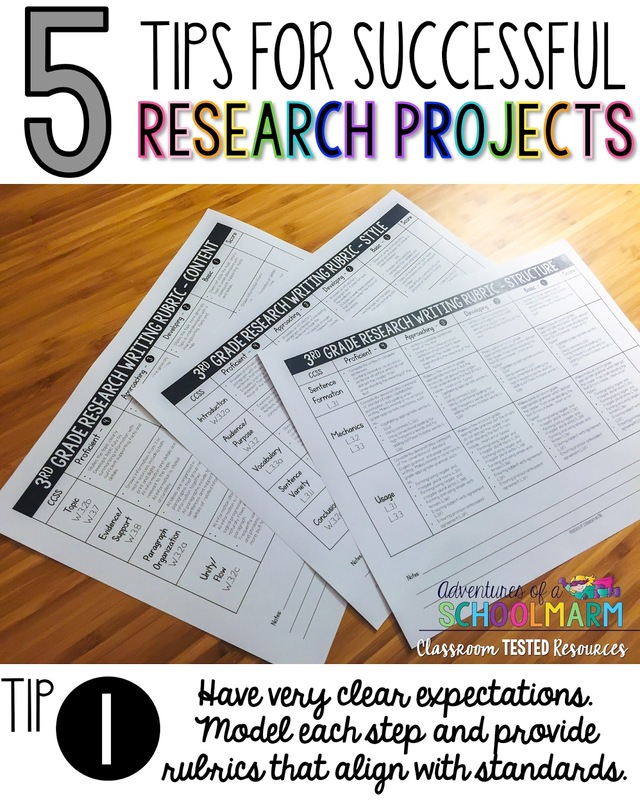 For my third graders, our research project was often their first experience with true research. I wanted to make sure their first experience was a positive one... and clear expectations was the foundation for their success! Elementary Research Project Tip #2: Have short work periods with a clear focus. Successful elementary research projects also require TIME. One of the biggest mistakes I made early on was trying to squeeze too much into a short block of time. This resulted in a poor experience for everyone. Our kids might have built up a stamina to read quietly for a longer period of time, but research is a much more intense process. My students work best when I break the project apart into smaller MINI-LESSONS that are spread out over a longer period of time. Elementary Research Project Tip #3: Provide scaffolding for struggling learners so all students can be successful. 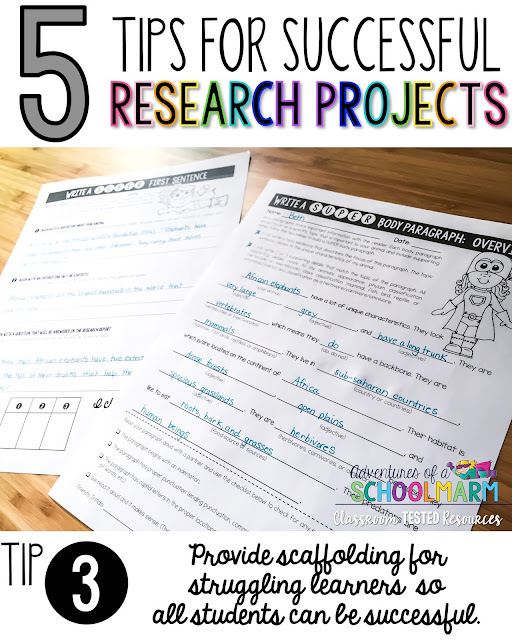 Successful elementary research projects require SCAFFOLDING embedded in the process so that all students can be successful. One way to scaffold for students is to provide research materials for them at a VARIETY OF READING LEVELS. I have found some great leveled materials through the Reading A-Z website. Another way to scaffold for students is to provide sentence and paragraph frames for students that need them. SENTENCE FRAMES give students a framework to follow in order to write a complete sentence on the proper topic. They also are wonderful for providing language support for students on IEPs or English Language Learners. I use them a lot in my classroom to help students explain their thinking during class discussions, so they are familiar with this type of scaffolding. PARAGRAPH FRAMES are similar and help students write an organized paragraph. Some students are able to generate sentences well, but have a difficult time writing a cohesive paragraph. Elementary Research Project Tip #4: Have a clear organization system in place. 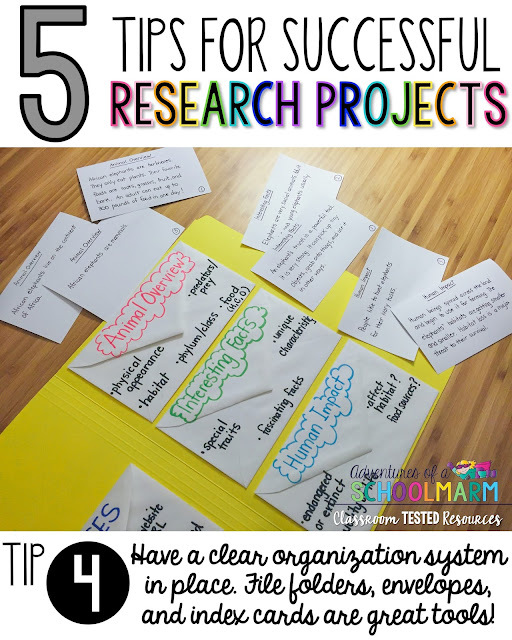 Successful elementary research projects also require a CLEAR SYSTEM FOR STAYING ORGANIZED. One of the easiest ways I have found is to give every student a FILE FOLDER that is specifically for their research materials. It also works to fold a large 11x17 piece of construction paper in half. Another helpful organizational tool for research projects are ENVELOPES. I like to give each student one envelope per body paragraph, plus an additional one for resources. For example, if you are doing a biography research project, the envelopes might say: Early Life, Interesting Facts, Accomplishments, and Resources. Glue the front of the envelope inside the file folder so that the opening and flap is facing outward, then label the flap. I like to have my students record their resources on separate INDEX CARDS. We write only one resource per card, then assign a number to each resource card. This is helpful as they collect their facts because they can just write the number of the resource where they found that information. INDEX CARDS are great for recording important facts and information. While it does use more index cards, I find it helpful to have students write one fact or idea per card, then write the number of the resource on the bottom right hand corner. I also like to have them label the topic (envelope) that it matches at the top of the card. This is incredibly helpful when students need to write their paragraphs because they can pull out all the cards and physically arrange them in an order that makes sense. Elementary Research Project Tip #5: Encourage students to create authentic products. Successful elementary research projects also work best when students are encouraged to create authentic and engaging products. One of my favorite tips for biography research projects is to have students write a paragraph about the person they researched in FIRST-PERSON POINT OF VIEW. This can lead to many different authentic projects, including having a WAX MUSEUM or giving SPEECHES. Another fun idea is to have a FASHION SHOW - a perfect follow-up for learning about animal adaptations, for example. There are so many possibilities! I hope you have found these research tips to be helpful for your classrooms. 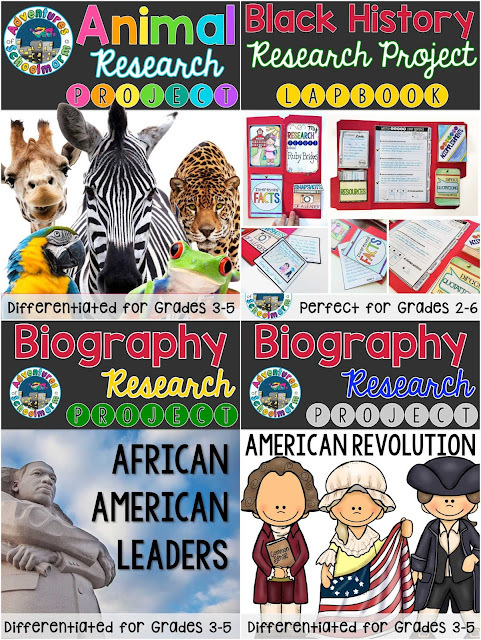 If you are interested in having some engaging, differentiated research resources that are already prepared for you, you might be interested in checking them out HERE or by clicking on the photo below. I'd also love to hear about how you incorporate authentic research into your classrooms in the comments below! Thanks for stopping by today!